The dental clinic staffed by a dental coordinator and volunteer dentist is currently opened on a part time basis. The days the clinic is open depends of the availability of the dentists. The Huntington Dental Society has taken the clinic on as its home mission project. Its members have been instrumental in the continuation of this program. Services provided in the dental clinic are: extractions, fillings, cleanings, and brushing and flossing instructions. Root canal therapy is referred to an endodontist who sees patients in his/her office. 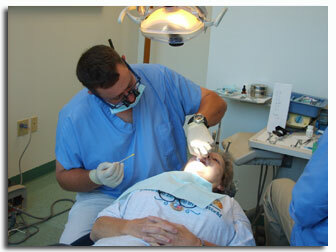 Complicated extractions are referred out to an oral surgeon who volunteers to see our patients in his/her office.